El Paso Locomotive FC's Mechak Jerome, Saint Louis FC's Joaquin Rivas and Phoenix Rising FC's Junior Flemmings could all have roles to play in the final Matchday of Concacaf Nations League Qualifying this week. 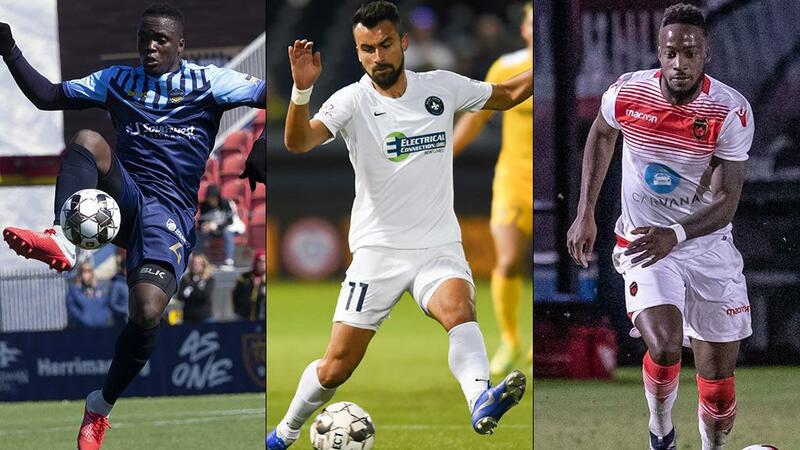 The 2019 USL Championship season may have only just kicked off, but for numerous players across the league this weekend is a major one on the international stage. Starting on Thursday, the March international window features the final games of 2018-19 Concacaf Nations League Qualifying, as countries vie to reach the 2019 Concacaf Gold Cup and earn a place in the top flight of the 2019 Concacaf Nations League. Almost 20 current USL Championship players have been selected for the final round of contests in the CNL, with 39 players total getting call-ups over this international break. Here’s a look ahead at what’s at stake in the CNL matchups they’ll feature in. A place in League B could be within reach for Turks & Caicos (1-2-0, 3pts, -18) and San Antonio FC’s Billy Forbes when it takes on the British Virgin Islands (0-2-0, 0pts, -9). Forbes’ two goals lifted Turks & Caicos to a 3-2 victory against St. Vincent and the Grenadines in Matchday 3 for the country’s first victory since 2014. That win five years ago came in a 2-0 result against the British Virgin Islands, which will leave Forbes and his teammates looking for a repeat performance and a chance at the middle-tier of competition in the CNL this fall. Jamaica (3-0-0, 9pts, +11) is one of six teams to make it this far with a perfect record and has one of the two largest contingents of current Championship players in its squad as it looks to secure its place at the Gold Cup and in League A for the Concacaf Nations League. That means it will only need to earn a draw on the road in El Salvador to ensure it keeps its top-six position. Louisville City FC’s Speedy Williams and Phoenix Rising FC’s Kevon Lambert could be key to holding down the fort against an attack that could feature Saint Louis FC’s Joaquin Rivas, who will try to add to his first international goal at the same venue last November against Haiti. Rivas and El Salvador (2-1-0, 6pts, +3) could need to pull out all three points to have a chance at the Gold Cup as their goal differential puts them 14th in the qualifying standings with the top 10 teams earning a place at this summer’s tournament. Sitting in 13th place in the CNL Qualifying standings going into the final round of games, Belize (2-1-0, 6pts, +4) enters its visit to Guyana (2-1-0, 6pts, +10) knowing it will likely need victory on the road to earn its second trip to the Concacaf Gold Cup in its history. Having scored his first goal for his country a year ago, it would be a timely moment for Rio Grande Valley FC’s Michael Salazar to find the net again as he and his teammates try to navigate their way to this summer’s tournament. Haiti (3-0-0, 9pts, +16) and Cuba (3-0-0, 9pts, +14) got plenty of work done in their opening three games, meaning a draw would ensure both teams advance to the Gold Cup and take their place in League A for the Concacaf Nations League in September. It would be foolish to think that El Paso Locomotive FC’s Mechack Jerome and Birmingham Legion FC loanee Zach Herivaux and their teammates will take their foot off the pedal on home turf, however, and those sitting in seventh place and below in the overall standings will certainly be hoping the Grenadiers can pull out a win and open the door for someone to jump past the Cubans. It’s the moment of truth for Bermuda (2-1-0, 6pts, +11) and the Charleston Battery’s Zeiko Lewis as they take on the Dominican Republic (2-1-0, 6pts, +7) with the country’s first trip to the Concacaf Gold Cup within reach. Bermuda’s victory last November against El Salvador put it into seventh place in the overall standings, but with nine teams sitting on six points going into the final round of contests it’s possible that a draw in the Dominican Republic might not be enough if other results don’t go Bermuda’s way. Lewis notched his first goal for the Battery this past Saturday in their win against Hartford Athletic and has three goals so far in CNL Qualifying. If he can sneak another one this Sunday to help Bermuda to victory, it would provide a historic moment for the Gombey Warriors. It’s unlikely there will be a place at the Gold Cup waiting for Guyana (1-2-0, 3pts, -9) even if it takes victory on the road against Puerto Rico (0-0-3, 0pts, -3), but a result could push the Charleston Battery’s AJ Paterson and his teammates into League B depending on how results go elsewhere. Paterson has scored twice so far in CNL Qualifying and will try to add to that total against OKC Energy FC goalkeeper Cody Laurendi and Tampa Bay Rowdies defender Shawn Barry. It’s arguable Puerto Rico has been among the unluckiest teams in this tournament, suffering three consecutive 1-0 defeats as Laurendi’s stellar play hasn’t been quite enough to earn a point so far. If Puerto Rico can break its duck and take victory on home turf, though, its goal differential would see it overtake Guyana and give it an outside shot at its own place in League B. Four players from Championship sides will try to help their countries reach the 2019 Africa Cup of Nations this summer. The first is Louisville City FC’s Sunny Jane, who is part of Lesotho’s squad to visit Cape Verde on Sunday as it looks to hold onto second place in qualifying Group L . A victory on the road for Lesotho would send the side to the finals for the first time in its history as it holds the head-to-head tiebreaker over third-place Tanzania. But if the game ends in a draw, Lesotho would need Tanzania to either draw or lose to group-leader Uganda. Over in Group G, the Charlotte Independence’s Joel Johnson (Liberia) and Cabwey Kivutuka (Congo) will both try to help their sides seal a place at the finals. Liberia enters the final game of the group in second place and will ensure its place at AFCON with victory on Sunday on the road against the third-place Democratic Republic of Congo. Kivutaka and Congo, meanwhile, enter their contest on Sunday with first-place Zimbabwe in fourth slot, but only three points back of their opponents. A victory would potentially move Congo past Zimbabwe on head-to-head record, and likely into the top two slots depending on the result between Liberia and DR Congo. Elsewhere in Concacaf, a Trinidad & Tobago squad filled with Championship players heads to face Wales on Wednesday in Wrexham for an exhibition contest, with the Soca Warriors already having qualified for the Gold Cup and League A thanks to their presence in the final round of Concacaf World Cup Qualifying in 2017. Among the players called up are the Memphis 901 FC trio of Leston Paul, Duane Muckette and Triston Hodge, OKC Energy FC’s Cordell Cato and Mekeil Williams and 2018 Championship All-League selection Neveal Hackshaw, now with Indy Eleven. Finally, nine players who have featured so far this season in the Championship have been named in the United States U-20 and U-23 National Team squads currently in Spain, with the U-20s entering its final training camp ahead of the FIFA U-20 World Cup in Poland this May. Tacoma Defiance goalkeeper Trey Muse, defenders Jaylin Lindsey of the Swope Park Rangers and Matthew Real of Bethlehem Steel FC and midfielder Andrew Carleton of ATL UTD 2 are joined by five other Championship alumni in Head Coach Tab Ramos’ squad, which will play exhibitions against France and Japan during its trip. The United States U-23 squad led by new Head Coach Jason Kreis, meanwhile, is beginning its preparation for the Concacaf Olympic Qualifying Tournament that will be held either at the end of this year or in early 2020. Among the players called up are the Portland Timbers 2 duo of defender Marco Farfan and Eryk Williamson, Reno 1868 FC goalkeeper J.T. Marcinkowski, Loudoun United FC defender Donovan Pines and Phoenix Rising FC forward Josh Perez. The quintet is joined by seven other players who have previously competed in the Championship.